Mauna Kea ( /ˌmɔːnə ˈkeɪ.ə/ or /ˌmaʊnə ˈkeɪ.ə/, Hawaiian: [ˈmɐwnə ˈkɛjə]) is a dormant volcano on the island of Hawaii. Its peak is 4,207.3 m (13,803 ft) above sea level, making it the highest point in the state of Hawaii. Most of the mountain is under water, and when measured from its oceanic base, Mauna Kea is the tallest mountain in the world  measuring over 10,000 m (33,000 ft). Mauna Kea is about a million years old, and has thus passed the most active shield stage of life hundreds of thousands of years ago. In its current post-shield state, its lava is more viscous, resulting in a steeper profile. Late volcanism has also given it a much rougher appearance than its neighboring volcanoes due to construction of cinder cones, decentralization of its rift zones, glaciation on its peak, and weathering by the prevailing trade winds. Mauna Kea last erupted 6,000 to 4,000 years ago and is now considered dormant. The peak is about 38 m (125 ft) higher than Mauna Loa, its more massive neighbor. In Hawaiian mythology, the peaks of the island of Hawaii are sacred. An ancient law allowed only high-ranking aliʻi to visit its peak. 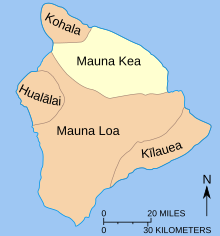 Ancient Hawaiians living on the slopes of Mauna Kea relied on its extensive forests for food, and quarried the dense volcano-glacial basalts on its flanks for tool production. When Europeans arrived in the late 18th century, settlers introduced cattle, sheep and game animals, many of which became feral and began to damage the mountain's ecological balance. 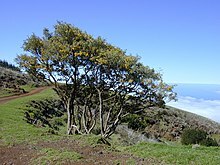 Mauna Kea can be ecologically divided into three sections: an alpine climate at its summit, a Sophora chrysophylla– Myoporum sandwicense (or māmane–naio) forest on its flanks, and an Acacia koa– Metrosideros polymorpha (or koa–ʻōhiʻa) forest, now mostly cleared by the former sugar industry, at its base. In recent years, concern over the vulnerability of the native species has led to court cases that have forced the Hawai'i Department of Land and Natural Resources to eradicate all feral species on the mountain. With its high elevation, dry environment, and stable airflow, Mauna Kea's summit is one of the best sites in the world for astronomical observation. Since the creation of an access road in 1964, thirteen telescopes funded by eleven countries have been constructed at the summit. The Mauna Kea Observatories are used for scientific research across the electromagnetic spectrum and comprise the largest such facility in the world. Their construction on a landscape considered sacred by Native Hawaiians continues to be a topic of debate. Mauna Kea is one of five volcanoes that form the island of Hawaii, the largest and youngest island of the Hawaiian–Emperor seamount chain. Of these five hotspot volcanoes, Mauna Kea is the fourth oldest and fourth most active. It began as a preshield volcano driven by the Hawaii hotspot around one million years ago, and became exceptionally active during its shield stage until 500,000 years ago. Mauna Kea entered its quieter post-shield stage 250,000 to 200,000 years ago,  and is currently dormant. Mauna Kea does not have a visible summit caldera, but contains a number of small cinder and pumice cones near its summit. A former summit caldera may have been filled and buried by later summit eruption deposits. 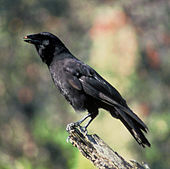 The ʻalalā or Hawaiian crow (Corvus hawaiiensis) is a bird in the crow family. It is extinct in the wild, with plans to reintroduce the species into the Hakalau Forest National Wildlife Refuge. Sunset over four telescopes of the Mauna Kea Observatories. From left to right: the Subaru Telescope, the twin Keck I and II telescopes, and the NASA Infrared Telescope Facility. The summit of Mauna Kea has an alpine climate. Due to the influence of its tropical latitude, temperature swings are very low in spite of its high elevation. Frosts are common year round, but in spite of the elevation no month is nearly below freezing in terms of average high, although March almost falls below 32 °F (0 °C) in average means. ^ "Why does OMKM spell "Maunakea" as one word?". Office of Maunakea Management. Archived from the original on September 3, 2018. Retrieved February 26, 2019. ^ a b c "Mauna Kea". NGS Station Datasheet. United States National Geodetic Survey. Retrieved October 27, 2015. ^ "Mauna Kea". Summits of the World. peakbagger.com. Retrieved October 27, 2015. ^ a b c d e f g h "Mauna Kea: Hawai'i's Tallest Volcano". Hawaiian Volcano Observatory – United States Geological Survey. May 22, 2002. Retrieved August 8, 2010. ^ Administration, US Department of Commerce, National Oceanic and Atmospheric. "What is the highest point on Earth as measured from Earth's center?". oceanservice.noaa.gov. Retrieved November 16, 2018. ^ a b c Watson, Jim (May 5, 1999). "The long trail of the Hawaiian hotspot". United States Geological Survey. Retrieved August 26, 2010. ^ Blichert-Toft, J.; Weis, D.; Maerschalk, C.; Agranier, A. & Albarède, F. (February 19, 2003). "Hawaiian hotspot dynamics as inferred from Hf and Pb isotope evolution of Mauna Kea volcano" (PDF). Geochemistry Geophysics Geosystems. American Geophysical Union. 4 (2): 8704. Bibcode: 2003GGG.....4.8704B. doi: 10.1029/2002GC000340. Retrieved May 22, 2002. ^ a b c d Cannon, E.C. ; Bürgmann, R. Roland (October 26, 2009). "Complete Report for Mauna Kea Volcano (Class B) No. 2601". United States Geological Survey. Archived from the original on February 16, 2012. Retrieved August 9, 2010. ^ a b Wolfe, E.W. ; Wise, W.S. 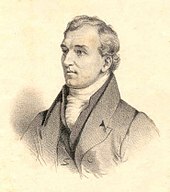 ; Dalrymple, G.B. (1997). The geology and petrology of Mauna Kea volcano, Hawaii : a study of postshield volcanism. Professional Paper 1557. United States Geological Survey. Retrieved September 18, 2010. ^ "Mauna Loa, Hawaiian Volcano Observatory, Summary" ( archive). volcanoes.usgs.gov. United States Geological Survey. November 2, 2017. Retrieved February 12, 2019. ^ "Science In Your Backyard: Hawaii". United States Geological Survey. October 2, 2009. Archived from the original on November 4, 2010. Retrieved October 25, 2010. ^ Schmincke, Hans-Ulrich (2004). Volcanism. Springer. p. 71. ISBN 978-3-540-43650-8. ^ "Mountains: Highest Points on Earth". National Geographic Society. Retrieved September 19, 2010. ^ a b c d e f Sherrod, David R.; Sinton, John M.; Watkins, Sarah E.; Brunt, Kelly M. (2007). "Geological Map of the State of Hawaii" (PDF). Open File report 2007-1089. United States Geological Survey. pp. 44–48. Retrieved April 12, 2009. ^ Foulger, G.R; Anderson, Don L. (March 11, 2006). "The Emperor and Hawaiian Volcanic Chains: How well do they fit the plume hypothesis?". MantlePlumes.org. Retrieved April 1, 2009. ^ Clague, David A.; Dalrymple, G. Brent (1987). "The Hawaiian-Emperor Volcanic Chain – Geological Evolution". In Decker, Robert W.; Wright, Thomas L.; Straffer, Peter H. (eds.). Volcanism in Hawaii: papers to commemorate the 75th anniversary of the founding of the Hawaii Volcano Observatory (PDF). Professional Paper 1350. 1. Washington, D.C.: Volcano Hazards Team, United States Geological Survey, United States Government Printing Office. p. 32. ^ "What in the world is the Hilo Ridge?". Hawaii Volcano Observatory – United States Geological Survey. January 8, 1998. Retrieved August 26, 2010. ^ Herzberg, Claude (November 30, 2006). "Petrology and thermal structure of the Hawaiian plume from Mauna Kea volcano". Nature. Nature Publishing Group. 444 (7119): 605–9. Bibcode: 2006Natur.444..605H. doi: 10.1038/nature05254. PMID 17136091. ^ Frey, F.A. ; Garcia, M. O.; Wise, W. S.; Kennedy, A.; Gurriet, P.; Albarede, F. (1991). "The Evolution of Mauna Kea Volcano, Hawaii: Petrogenesis of Tholeiitic and Alkalic Basalts". Journal of Geophysical Research. 96 (B9): 14, 347. Bibcode: 1991JGR....9614347F. doi: 10.1029/91JB00940. ^ a b Hon, Ken. "GEOL205 – Fire and Ice – Mauna Kea: Lecture Notes". University of Hawaii at Hilo. Retrieved September 17, 2010. ^ "Hawaiian Volcano Observatory: Photo Information". Photo description. United States Geological Survey. March 13, 1998. Retrieved August 9, 2010. ^ Porter, Stephen C. (April 23, 1971). "Holocene Eruptions of Mauna Kea Volcano, Hawaii". Science. American Association for the Advancement of Science. 172 (3981): 375–7. Bibcode: 1971Sci...172..375P. doi: 10.1126/science.172.3981.375. PMID 17756040. Retrieved September 19, 2010. ^ Porter, Stephen C. (June 1973). 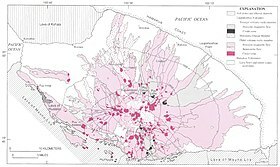 "Stratigraphy and Chronology of Late Quaternary Tephra along the South Rift Zone of Mauna Kea Volcano, Hawaii". Geological Society of America Bulletin. Geological Society of America. 84 (6): 1923–40. Bibcode: 1973GSAB...84.1923P. doi: 10.1130/0016-7606(1973)84<1923:SACOLQ>2.0.CO;2. ISSN 0016-7606. ^ Gregory, Herbert Ernest; Wentworth, Chester Keeler (December 1937). "General features and glacial geology of Mauna Kea, Hawaii". GSA Bulletin. Geological Society of America. 47 (12): 1719–42. Bibcode: 1937GSAB...48.1719G. doi: 10.1130/gsab-48-1719. Retrieved September 19, 2010. ^ a b c d e f g h i j k l m n o Institute for Astronomy – University of Hawaii (January 2009). "Mauna Kea Comprehensive Management Plan: UH Management Areas". Hawai`i State Department of Land and Natural Resources. Archived from the original (PDF) on March 4, 2016. Retrieved August 19, 2010. ^ a b "Hawaiʻi: Hawaii's Comprehensive Wildlife Conservation Strategy" (PDF). Hawaii Department of Land and Natural Resources. October 1, 2005. Archived from the original (PDF) on August 19, 2010. Retrieved August 14, 2010. ^ Stearns, Harold Thornton; MacDonald, Gordon Andrew (1946). Geology and ground-water resources of the island of Hawaii. Bulletin. 9. United States Geological Survey. p. 245. ^ "Impermeable beds trap rain and snow at Mauna Kea's Lake Waiau". Hawaii Volcano Observatory – United States Geological Survey. June 19, 2003. Retrieved August 9, 2010. ^ "University plans to drill for water beneath Mauna Kea". Big Island Video News. Big Island Video News. July 26, 2012. Retrieved April 16, 2015. ^ Miller, Erin (February 18, 2014). "Mauna Kea aquifers shallower than expected". Oahu Publications, Inc. West Hawaii Today. Archived from the original on August 5, 2015. Retrieved April 16, 2015. ^ Watson, John (July 18, 1997). "Lava Flow Hazard Maps: Kohala and Mauna Kea". United States Geological Survey. Archived from the original on January 29, 2009. Retrieved August 9, 2010. ^ "The next eruption of Mauna Kea". Hawaii Volcano Observatory – United States Geological Survey. June 5, 2000. Retrieved August 10, 2010. ^ "Final Environmental Statement for the Outrigger Telescopes Project: Volume II" (PDF). NASA. February 2005. p. C–9. Archived from the original (PDF) on April 21, 2009. Retrieved August 22, 2010. ^ a b c d e f g h i j k l m "Culture: The First Arrivals: Native Hawaiian Uses" (PDF). Mauna Kea Mountain Reserve Master Plan. University of Hawaii. Archived from the original (PDF) on November 8, 2012. Retrieved August 17, 2010. ^ Kirch, Patrick V. (January 1982). "The Impact of the Prehistoric Polynesians on the Hawaiian Ecosystem". Pacific Science. University of Hawaiʻi Press. 36 (1): 1–14. Retrieved October 24, 2010. ^ Athens, Stephen; Tuggle, H. David; Ward, Jerome V.; Welch, David J. (2002). "Avifaunal Extinctions, Vegetation Change and Polynesian Impacts in Prehistoric Hawai'i" (PDF). Archaeology in Oceania. 37 (2): 57. ^ Martin Gray; Graham Hancock (2007). Sacred Earth: Places of Peace and Power. Sterling Pub.Company. p. 254. ISBN 978-1-4027-4737-3. ^ Luci Yamamoto; Alan Tarbell (2005). Hawai'i: The Big Island. Lonely Planet. p. 137. ISBN 978-1-74059-691-6. ^ "The White Mountain". Mauna Kea Visitor Information Station. n.d. Retrieved March 25, 2018. ^ Pukui, Mary Kawena; Elbert, Samuel H. (1986). Hawaiian dictionary. University of Hawaii Press. p. 242. ISBN 0-8248-0703-0. ^ William Mission Ellis (1827). Narrative of a Tour Through Hawaii, Or, Owhyhee, with Observations on the Natural History of the Sandwich Islands. H. Fisher, son, and P. Jackson. pp. 446–448. ^ Alton Pryor (2004). Little Known Tales in Hawaii History. Stagecoach Pub. pp. 144–147. ISBN 978-0-9747551-1-3. ^ Daniel Ethan Chapman (2010). Examining Social Theory: Crossing Borders/reflecting Back. Peter Lang. p. 8. ISBN 978-1-4331-0479-4. ^ "Kaluakauka Revisited: the Death of David Douglas in Hawaii". Hawaiian Journal of History. Hawaiian Historical Society, Honolulu. 22: 147–69. 1988. ^ a b c d "Recreation: Enjoying Mauna Kea's Unique Natural Resources" (PDF). Mauna Kea Mountain Reserve Master Plan. Institute for Astronomy – University of Hawaii. Archived from the original (PDF) on August 19, 2010. Retrieved August 17, 2010. ^ Sakai, Ann K.; Wagner, Warren L.; Mehrhoff, Loyal A. (2002). "Patterns of Endangerment in the Hawaiian Flora" (PDF). Systematic Biology. Oxford University Press. 51 (2): 276–302. doi: 10.1080/10635150252899770. PMID 12028733. ^ a b c d Stone, Charles P.; Cuddihy, Linda W. (1990). "Changes in Vegetation Since 1850". Alteration of native Hawaiian vegetation-Effects of humans, their activities and introductions (PDF). University of Hawaii Press. ISBN 0-8248-1308-1. ^ Stone, Charles P.; Cuddihy, Linda W. (1990). "Alien Plants". Alteration of native Hawaiian vegetation-Effects of humans, their activities and introductions. University of Hawaii Press. ISBN 0-8248-1308-1. ^ Walker, Lawrence R.; Powell, Elizabeth Ann (July 1999). 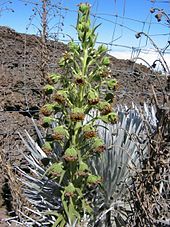 "Regeneration of the Mauna Kea silversword Argyroxiphium sandwicense (Asteraceae) in Hawaii". Biological Conservation. Elsevier B. V. 88 (1): 61–70. doi: 10.1016/S0006-3207(98)00132-3. ^ "Mauna Kea Ice Age". Hawaii Department of Land and Natural Resources. Retrieved August 13, 2010. ^ Ashlock, Peter D.; Gagné, Wayne C. (April 26, 1983). "A Remarkable New Micropterous Nysius Species from the Aelion Zone of Mauna Kea, Hawaii island" (PDF). International Journal of Entomology. Bernice P. Bishop Museum. 25 (1): 47–55. Retrieved August 14, 2010. ^ "Wekiu bugs-life on top of a volcano". Volcano Watch. Hawaiian Volcano Observatory – United States Geological Survey. Retrieved August 14, 2010. ^ a b Scrowcroft, Paul G. (1983). "Tree Cover Changes in Mamane (Sophora chrysophylla) Forests Grazed by Sheep and Cattle" (PDF). Pacific Science. University of Hawaii Press. 37 (2): 109–20. Retrieved August 11, 2010. ^ Hess, Steven; Kawakami Jr, Ben; Okita, David; Medeiros, Keola (2006). "A Preliminary Assessment of Mouflon Abundance at the Kahuku Unit of Hawaii Volcanoes National Park". United States Geological Survey. p. 1. See: Giffin, J.G. (1982). Ecology of mouflon sheep on Mauna Kea (Report). Honolulu, HI: Department of Land and Natural Resources, Division of Forestry and Wildlife. ^ Palila v. Hawaii Department of Land & Natural Resources , 639 F.2d 495, 79-4636 ( United States Court of Appeals, Ninth Circuit February 9, 1981). ^ Banko, Paul et al. Surveys reveal decline of the palila. Endangered Species Bulletin, Fall 2008. ^ Cai, Junning; Leung, Ping Sun (April 2004). "Economic Impact of Shutting Down Hawaii's Sugar Industry" (PDF). Economic Issues. College of Tropical Agriculture and Human Resources. Retrieved September 27, 2010. ^ a b c "Welcome to Hakalau Forest National Wildlife Refuge". US Fish and Wildlife Service. April 6, 2010. Retrieved August 16, 2010. ^ a b c d "About Mauna Kea Observatories". Institute for Astronomy – University of Hawaii. Retrieved August 19, 2010. ^ a b "Mauna Kea Science Reserve Astronomy Development Plan 2000–2020 – Summary" (PDF). Institute for Astronomy – University of Hawaii. August 1999. Archived from the original (PDF) on August 21, 2010. Retrieved August 19, 2010. ^ a b c Pickles, Andrew (2003). "Timeline of Astronomy in Hawai'i". Mauna Kea Observatories Outreach Committee. Archived from the original on July 27, 2011. Retrieved October 2, 2010. ^ University of Hawai`i (January 2009). "Mauna Kea Comprehensive Management Plan" (PDF). Hawai`i State Department of Land and Natural Resources. pp. 6–1. Archived from the original (PDF) on March 4, 2016. Retrieved January 18, 2012. ^ a b "Mauna Kea Telescopes". Institute for Astronomy – University of Hawaii. Retrieved August 29, 2010. ^ Robert F. Oaks (November 1, 2003). Hawaii:: A History of the Big Island. Arcadia Publishing. p. 131. ISBN 978-1-4396-1403-7. ^ Ned Kaufman (September 11, 2009). Place, Race, and Story: Essays on the Past and Future of Historic Preservation. Routledge. p. 14. ISBN 978-1-135-88972-2. ^ "Ruling could block Mauna Kea projects". Pacific Business News. August 8, 2006. Retrieved November 4, 2010. ^ "Thirty Meter Telescope Selects Mauna Kea". Press release. Caltech, University of California, and the Association of Canadian Universities for Research in Astronomy. August 21, 2009. Archived from the original on August 10, 2010. Retrieved August 29, 2010. ^ "University of Hawaii Develop New Telescope for "Killer" Asteroid Search". Press release. Institute for Astronomy – University of Hawaii. October 8, 2002. ^ "Massive telescope to be built in Hawaii". 3 News NZ. April 15, 2013. ^ Kelleher, Jennifer Sinco (October 7, 2014). "Protesters halt Mauna Kea telescope groundbreaking". staradvertiser.com. Honolulu Star Advertiser. Retrieved April 4, 2015. ^ Davis, Chelsea (March 26, 2015). "Thirty Meter Telescope protesters continue to block construction on Mauna Kea". WorldNow and KHNL. KHNL. Retrieved April 4, 2015. ^ a b "Clash in Hawaii Between Science and Sacred Land". AP/US News and World Report. Associated Press. April 3, 2015. Retrieved April 4, 2015. ^ "Police, TMT Issue Statements on Mass Arrests on Mauna Kea". Big Island Video News. Big Island Video News. April 2, 2015. Retrieved April 4, 2015. ^ "Amid controversy, construction of telescope in Hawaii halted - US News". Retrieved April 7, 2015. ^ "Gov: Hawaii has 'failed' Mauna Kea; telescope can continue". Hearst Stations Inc. on behalf of KITV-TV. Associated Press/KITV. May 26, 2015. Archived from the original on July 25, 2015. Retrieved July 24, 2015. ^ Hawaii top court approves controversial Thirty Meter Telescope BBC News, 2018-10-31. ^ "Frequently Asked Questions: What is the weather like in the winter...spring...& the fall? &...Does it snow in Hawaii?". noaa.gov. National Oceanic and Atmospheric Administration, National Weather Service. Retrieved April 15, 2018. ^ WRCC. "Western U.S. Climate Historical Summaries Weather". Western Regional Climate Center. Retrieved November 4, 2010. ^ Juvik, Sonia P.; Juvik, James O.; Paradise, Thomas R. (1998). Atlas of Hawaii (3rd ed.). Hilo: University of Hawaii Press. p. 71. ISBN 0-8248-2125-4. ^ "Hawaii Island". Hawaii Department of Land and Natural Resources. Retrieved July 27, 2017. ^ Tarbell, Alan; Yamamoto, Luci (August 1, 2005). "Around Mauna Kea". Hawai'i: the big island. Lonely Planet. pp. 145–46. ISBN 978-1-74059-691-6. ^ Onopa, J.; Haley, A.; Yeow, M. E. (2007). "Survey of acute mountain sickness on Mauna Kea". High Altitude Medicine & Biology. Mary Ann Liebert, Inc. 8 (3): 200–5. doi: 10.1089/ham.2007.8307. PMID 17824820. ^ "Mauna Kea Hazards: Please Read Before Travelling Above Hale Pohaku" (PDF). Safety Leaflet. Institute for Astronomy – University of Hawaii. Archived from the original (PDF) on June 9, 2010. Retrieved August 28, 2010. ^ "Star Gazing Program". Mauna Kea Support Services. Retrieved September 18, 2014. Ciotti, Joseph E. "Historical Views of Mauna Kea: From the Vantage Points of Hawaiian Culture and Astronomical Research," Hawaiian Journal of History, 45 (2011), 147–66. Wikimedia Commons has media related to Mauna Kea. Mauna Kea. Hawaii Center for Volcanology. Mauna Kea Observatories. Tour of Mauna Kea's summit facilities. Mauna Kea Visitor Information. Information pertaining to visiting the summit telescopes. Office of Mauna Kea Management. Plan for land management. Mauna Kea Ice Age Reserve. Department of Land and Natural Resources.